In most Indo-European languages, verb phrases have no polarity category, rather, negative sentences are used with negative adverbials. 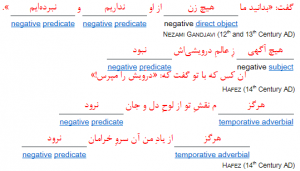 که: «ای بلندنظر! شاه‌بازِ سِدره نشین! In such cases, the sentence is negative, even though the verb phrase is affirmative. وآن مواعید که کردی مرواد از یادت! نامه‌ها رسیده که: «فرصت‌جویان می‌بجنبند». پخته تویی، خام تویی، خام بمگذار مرا! The application of the prefix /be-/ strongly depends on the idiom and the mood. 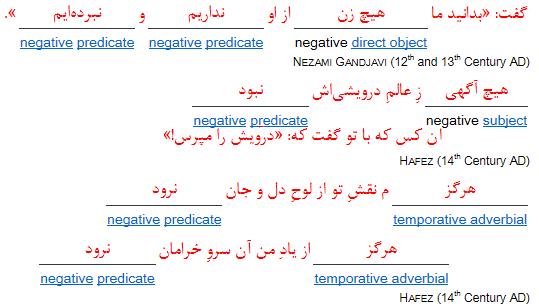 For example, in the standard language of Iran it appears only with present participles, namely in the syntax of the imperative (/bekuʃ/ بکوش) and potential present (/bekubi/ بکوبی), as well as in copulative compositions (/bezæn-bezæn/ بزن‌بزن) and copulative coordinations (/beriz o bepɒʃ/ بریز و بپاش).